It’s hard to top the overwhelming prestige of Wolf Hall. 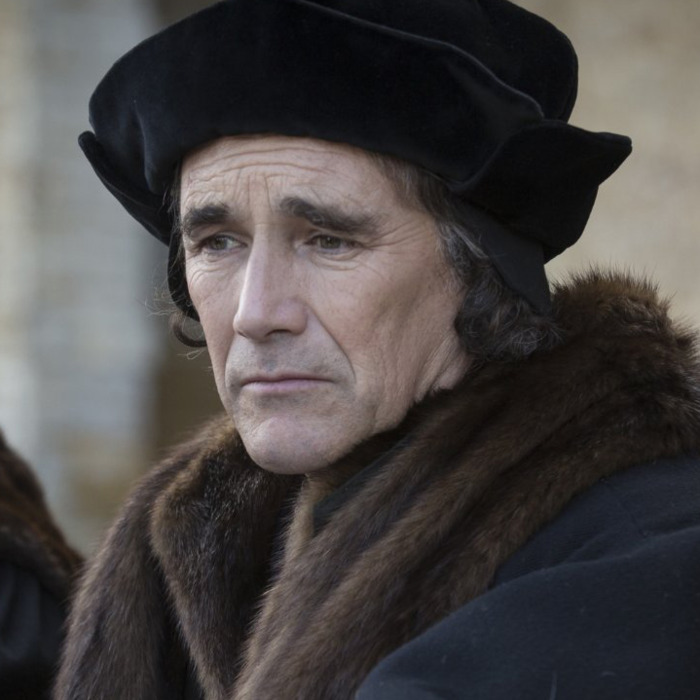 It’s based on Hilary Mantel’s revered, Booker Prize–winning books, Wolf Hall and Bring Up the Bodies; it stars Tony- and Olivier-winner Mark Rylance as Thomas Cromwell; it’s British; and even the candles seem historically crafted for excellence. And the six-part miniseries, premiering Sunday on PBS, is indeed largely excellent. Sometimes in unexpected ways. The most surprising feature of Wolf is its sense of humor. Period dramas, particularly ones set in the 1500s, aren’t really known for their hijinx, but there’s no better way to get to know a character’s voice than to hear him or her be funny. And Wolf is invested in its characters’ full lives, in their moments of repose or vulnerability. Groups of people make jokes. Friends tease each other, or roll their eyes, and Wolf fluidly includes those simple behaviors, even as we see these grand, majestic circumstances. In a moment of sad desperation, a woman pleads with Cromwell, lamenting that he’s, cruelly, always up to some kind of trick. He responds, brightly, that he was just “born tricky!” and it’s at once dismissive, defensive, and kind of silly. I chuckled. We see Cromwell exchange “oy, this guy” glances here and there, and be sardonic and wry. Part of this is in the writing, certainly, but a lot of it is Rylance and his distinguished eyebrows, adding depth and humanity to what could otherwise feel like TV vegetables. Watch this show; it’s good for you. Wolf Hall is telling a familiar story: We open in 1529, with King Henry VIII getting pretty antsy: He’s been married for 20 years but has no male heirs, and the pope is not granting the annulment he’s looking for. His adviser, Thomas Cromwell, has some suggestions of next moves, and off we go. But the book’s calling card is that it tells that story in a bigger, better, more complicated and rich way, reframing the generally maligned Cromwell in a more sympathetic light, playing up the psychology of its figures, not just their historical significance. It’s harder to convey that interior life on a show than in prose, but that’s exactly what acting is for. Claire Foy gives Anne Boleyn just enough edge, but Damien Lewis falls slightly short as King Henry VIII. His performance is less grounded, less textured than the others. Henry VIII is a person — an actual person, somehow! — who has been the object of fascination for 500 years. Shouldn’t he be more interesting here? Shouldn’t everything, actually? Rylance is so hypnotizing, it’s easy to get carried away just on his performance alone, but there’s a slight undersaturation to everything else. The show’s restrained enough that the raising and lowering of a hand is a real moment, and in our era of Game of Thrones–y excess, that discipline is admirable. If I wanted crazy scintillation, I could have watched The Tudors. But that sense of dramatic conservation gets just a little bit stifling, and sometimes Peter Kosminsky’s staid direction makes the series feel like a top-collar button begging to be undone, even just for a second, while no one is looking. Of course Wolf Hall is about the undoing of proper things while everyone is looking, and what those undoings cost each of us personally, socially, and, in this case, eventually, globally. Wolf uses Cromwell as the vessel for those costs, and episode to episode we see his growth and his decay, how he assembles his psyche depending on whom he’s talking to, and how the power he wields is both thrilling and revolting. There’s a scene where we see Cromwell sit for a portrait, and as the artist looks from Cromwell to his canvas and back, you can’t help but be struck by how much there is to paint.